Take a fresh look at the opportunities to leverage technology in your center. Our annual challenges and priorities survey, as well as our project experience, show that high attrition, absence and adherence issues, and the uphill battle to gain budget approval for additional staff remain pain points for many centers. While technology is not a “white knight” riding in to solve the staffing problems, it can be used effectively to target workload reduction, engage employees and improve planning. The first target to reduce workload is volume. I’m willing to bet you can identify a percentage of contacts that could be better handled in other ways, or just shouldn’t exist in the first place. Self-service is an obvious approach to reduce incoming contacts. Interactive voice response (IVR) is the channel most likely to be “owned” by the contact center, yet its pull seems to be ever decreasing as other channels gain more appeal. It may get a new life with a natural language interface if the customer demographic and contact types are well-suited to the voice channel. Centers may also consider artificial intelligence (AI) or “bots,” as many IVR offerings (especially cloud) are touting this as the new wave. We are still in the early adopter stages with this technology, and the hype train is roaring. Anyone considering this path should define plans and requirements carefully and vet solution options with great care. Probe whether the capabilities are truly “intelligent,” or just rely on a set of business rules. Explore how the design, development and tuning of an IVR will deliver the volume reduction you seek, expanding applications and improving interfaces. If voice interactions are not your best option, or your alternative channels are on the rise, take a fresh look at your text-based communication (text/SMS, web chat, email, social media, tickets, etc.). While you may first think of them as assisted service through an agent, they may have self-service elements with the right tools and interfaces. Like an IVR, the “smarts” can be business rules or AI, providing answers where it can and routing to an agent only when the system can’t succeed. You might hear them referred to as “intelligent virtual assistants” or IVAs. Look at options that leverage the same AI engine across multiple channels such that one omnichannel bot provides answers and gets smarter off interactions that are speech-based or text-based. Any initiative to reduce volume should engage other departments as they may be the cause of some contacts, or may own other self- service channels. A mobile app or online capability should be reviewed for additional (or better) self-service, as well as for optimization of channel-crossing into the center. While opportunities vary significantly by vertical in terms of “routine” users and types of transactions, centers across financial, retail, healthcare, transportation, business-to-business, utilities, telecom, high-tech and travel/transportation can probably stir up some improvements. A little integration can go a long way to enable the center to leverage what was already accomplished in an app or portal (including authentication) if a customer seeks assistance through a call, web chat or text/SMS session, for example. When you have good mobile and web self-service, boost participation through a targeted effort, helping people sign up to use it and continue to use it. The center can play a role in this initiative, and desktop tools (covered in the next section) can help guide agents on when to promote it with a customer who isn’t signed up or using these options. With screen-sharing, the agent can even guide them through successful onboarding or actions. A tried-and-true option to reduce volume is proactive outbound (aka alerting or notification). This application can be offered through a variety of channels (voice, text, email) and can be administered online, via mobile app, or through an agent. Messages can be very specific to the customer and situation, and the timely information they provide can prevent a much more time-consuming inbound interaction. Keeping in mind first-contact resolution (FCR) prevents subsequent contacts, look at tools to improve FCR if your performance is not where it could be. The set of tools to help are also typically ones that reduce handle time—which we address in the next section—including knowledge base and collaboration. Avoiding an escalation or call-back serves the customer and the center well. The second contributor to workload is handle time, and there are ample reasons why talk time and/or wrap-up (or after-call work) time are higher than they need to be. Although self-interest may prompt you to look for improvement opportunities, you’ll make customers happy, too, as few want to spend much time on those calls. And agents are going to like their jobs better if they can succeed more readily—whether a new agent feeling less overwhelmed, or a veteran handling a complex or atypical contact. Leveraging the front end of self-service, even if it’s just information gathering, is a good place to start. Improving authentication and passing the status to an agent can pay dividends in tens of seconds per call. Clearly identifying the reason for the call can help routing, therefore reducing transfers and the associated waste of time. The desktop is the next target, and opportunities abound. Age-old “screen pops” are not ubiquitous, but with today’s technology they should be. If you’re not popping screens into the customer’s account, a relevant script for the call type, or some other great launching point for the conversation, it’s time to pursue it. Screen pops are relatively easy and a little collaboration between the IT team and the vendor can probably deliver a quick win. We find it amazing how much walking around still occurs even though everyone seems to agree agents shouldn’t have to leave their seats to get help or answers! Collaboration tools help agents access subject-matter experts, whether supervisors, higher tiers or others across the enterprise. These tools may be part of an enterprise solution, a contact center solution, or CRM, and enable instant messaging, screen sharing and/or a persistent shared session workspace for groups to communicate. Knowledge management is another great source of answers but a technology that is rarely well-used. Many of these tools are part of a CRM, but there is a resurgence of standalone cloud-based tools as well, with innovations tied into bots and a variety of channels. A good KM will provide excellent search and deliver bite-sized answers to an agent or a customer quickly. KM is also another area where AI can play a role, learning from the questions and resolutions, and potentially leveraging the same engine as the self-service tools discussed earlier. While all these elements can help with the realities of understaffing, one more thing is worth looking at: How do you make the case for more staff? Sometimes leadership doesn’t understand the “math problem” of how many people it takes to handle a given workload while meeting performance goals, and you can help them with a little awareness building. Workforce management (WFM) is the tool to help with forecasting and scheduling—and educating leadership. Model the situation with realistic numbers, not hopebased numbers. Use the actual handle time that reflects what is really occurring because of poor desktop tools, increasingly complex contacts, the repetition that occurs in authentication when you lack integration in channel crossing, etc. Include the volumes that have been created by back-office issues or poor self-service. Baseline the number of staff you need to handle the workload presented given the current state. And if you are growing or experiencing other changes that will further boost staff demands, show that reality, too. Then run “what-if” scenarios with volume changes and handle time changes. Show the potential value of technology that reduces volumes or handle times. WFM tools are increasingly sophisticated to deal with various channels and longer term forecasts. Don’t just rely on spreadsheets and home-grown models that few can understand and skeptics won’t embrace. You can also model “what-if” savings from increased retention and adherence. Look at your hiring and training costs, or use “standard” numbers that vendors quote. Show how a small improvement in schedule adherence can resolve understaffing on your worst days or intervals. As you do your modeling, consider the barriers—real or artificial—that you face in optimizing staffing to have the right number of staff at the right times. Budget, labor pool, hours of operation, volatile peaks and facilities can all weigh heavily on solving the puzzle. Good tools can help you ameliorate some of the issues and educate leadership on strategic decisions that have real “in the trenches” impacts. My favorite “big bang for your buck” technology opportunity at the desktop is also the simplest: Add a second monitor! For relatively low cost, you can improve the agents’ navigation, avoid them writing things down, give them greater visibility into more important information, and watch your handle time drop while your accuracy goes up. Speaking of the desktop, if yours is a mess with many applications, lots of logging in, duplicate entries or lots of copy paste, look at consolidated desktop applications that create a front-end targeted to the interaction and its workflow. Agents can have what they need at their fingertips, easier navigation, improved information capture and more. 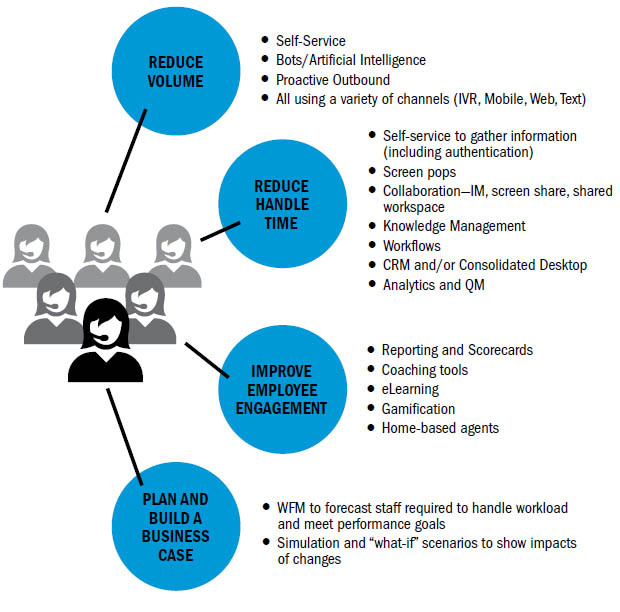 These solutions can be part of CRM or work with it, and can include workflows and KM. Workflows should target the still too prevalent manual processes that go on within the center and with other parts of the organization. Paper forms, folders and manual faxing should all be things of the past. They have a high cost in workload and introduce potential issues such as errors, time delays and tracking or status voids. I can’t overemphasize the importance of processes with all of these technologies. It’s easy to use them poorly otherwise. For example, you must maintain KM content, develop proper workflows (triggers, actions, etc. ), define rules of engagement for collaboration tools, set up target groups, and define authentication “what-if” scenarios based on what pops. The other “must have” is integration between applications, which means more than just hot links. Centers need to pursue approaches that eliminate copy-paste and writing notes onto paper or electronic notepads, and seek to never ask a customer to repeat information already provided! Workforce optimization (WFO) can play a role in optimizing handle time through analytics and quality monitoring (QM) tools. Desktop analytics can help a center understand how people are using their systems and find improvements in training, processes, and systems that can directly impact handle time. QM, including screen recording and speech analytics, present a similar opportunity to look at where time is being spent and efficiencies gained. Employee engagement is the positive buzz phrase that everyone is focusing on these days—and WFO can play a key role in it. In a positive (not punitive or “big brother”) way, it can help you retain agents, have them in their seats when they should be, and optimize their performance. The problems we are trying to tackle with WFO in the understaffed world are all about staff performance. You can tie culture in with technology tools that help people succeed, hold them accountable, reward them and reinforce desirable behaviors. For example, reporting and scorecards can show performance results in a fair, objective and even fun way when you have color-codes and graphics. Analytics helps identify trends, changes in handle times or struggling agents. Coaching and eLearning can be leveraged to help everyone feel valued and achieve the defined goals. New staff can achieve proficiency (and lower handle times and higher resolution rates) sooner. New and experienced staff continue to receive coaching and development that can boost early success and secure ongoing success that can perhaps make a dent in attrition. Centers that take WFO to the next level can use gamification to reward and reinforce. If home-based agents are an option in your culture, keep that in mind as another thing that can help retain agents—and potentially some of your best performers. Technology to securely connect remote agents is wellproven. The WFO tools help you manage them just like onsite agents. And if facilities limitations contribute to your understaffing, home agents may be just what you need. Any of the WFO tools can also help reduce handle time through awareness and focus, while not making “AHT” a specific metric and potentially driving counterproductive behavior. The intent is to use WFO tools to get everyone in a common range, identify outliers, trends, problems and opportunities for change, and work on continuous improvement. No technology is a silver bullet, but many tools can make a dent in the key things that contribute to understaffing. (SEE FIGURE 1.) While attrition, adherence and absenteeism are perpetual challenges, better technology to reduce volumes and handle times and optimize the agent experience can help mitigate these contact center realities and help you meet performance goals. If you face limitations in your hiring and staffing plans, it’s time to take a fresh look at the opportunities to leverage technology in your center.